The island of Spetses is truly blessed. The sun shines down on gorgeous beaches, charming old houses, elegant squares, traditional tavernas and stylish boutiques. And a lack of cars that harkens fresh air, quiet and a relaxed pace of life where there is always time for a tiny cup of Greek coffee and a game of backgammon while you watch the quay for the latest arrivals...Package tourism hasn't caught on here and the majority of the best places to stay in Spetses are smaller hotels or privately rented rooms. Spetses has beauty, peace and well preserved streets that create an authentic Greek island experience - a big draw for the sailing crowds. At times it can feel like a bit of a playground for rich and famous Athenians. Most people will alight at the quay at Dapia. This is where you will find some of the loveliest old mansions. Behind Dapia, which is basically the new harbour, you will find the Old Harbour. Still a working harbour it is crammed with vessels of all kinds from fishing boats to luxury yachts. This area has plenty of character and is a good place to hang out and soak up the atmosphere of a really unique little community. As well as the truly excellent restaurants Spetses has quite a buzzing nightlife for its size. There are also gorgeous beaches. Private cars are banned on the island - one reason it has a reputation for being so peaceful - but there are regular buses to the island's best beaches and bike or motorbike hire is available. In season you can also take a water taxi around to the main beaches and to some of the harder-to-reach beaches and coves. Hilariously there are apparently just four car taxis. A good indication of the size of Spetses! As well as relaxing and enjoying yourself in some of Greece's most charming surroundings, Spetses has a few museums which tell you of the history of the island. The Hotel Guru's pick of the best places to stay in Spetses features a luxury grand dame overlooking the harbour and a chic hotel with villas for larger groups. As well as standard contemporary chic hotel rooms, the Orloff Resort has two private villas which each sleep ten. Contemporary and chic, the rooms are fresh and white and packed with lovely details. If you prefer fitting in with the rich and famous crowd then definitely one of the best places to stay in Spetses is the Poseidonion Grand Hotel. With not two, but three excellent restaurants to choose from, this hotel also has a spa, private balconies for all, wonderful views over the harbour and the 'wow factor'. If your looking for somewhere a little more private, we recommend visiting our online partner Booking.com. Spetses does not have an airport, so the best option is to fly to Athens. From Athens, head to the port of Piraeus where you can catch daily ferries out to Spetses. This will take about three hours. Private cars are banned on the island so care hire is a no go. The best time to visit Spetses is from May to September. If you are looking for something extra special, go in early September to soak up the amazing festival atmosphere during the Armata. Browse through our list of all the best places to stay in Spetses. For some personal travel advice contact one of our friendly Gurus. Want to widen the search? Check out our recommendations for the best places to stay in the Peloponnese. Wonderfully contemporary chic hotel with rooms, suites and two private villas sleeping 10 each. Wonderful pool, spa, and all white rooms with all the mod cons. A great choice for couples, families or groups of friends. Private villas - 2 houses sleep 10 each. 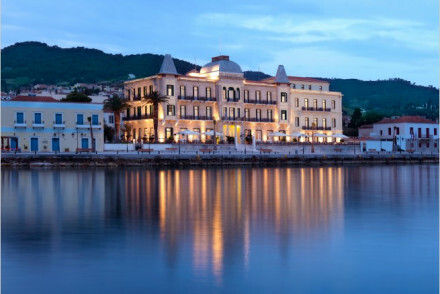 Super luxurious hotel on the coastline of Spetses overlooking the harbour. Film star all white bedrooms and suites are enormous with private balconies and all the mod cons. Three excellent restaurants, fabulous pool and excellent spa. A wow factor choice for any luxury traveller. Views - Fantastic sea views.